Reducing pollutants in the air is important for human health and the environment. Poor air quality has harmful effects on human health, particularly the respiratory and cardiovascular systems. Pollutants can also damage plants and buildings, and smoke or haze can reduce visibility. At the community level, you can reduce air pollutants by choosing to walk, cycle or take public transport rather than drive a car. You can also keep your car in good condition and drive to reduce fuel consumption and minimise emissions. You can buy items that have low-energy manufacture and use requirements, or which can be recycled. Good urban design and planning can also reduce pollution by having cleaner, ‘greener’ choices for the public. These may include increasing walking and cycling paths and having urban ‘hubs’ where people work, play and shop locally, reducing their need to travel. Farmers can reduce air pollution by conducting hazard-reducing burning at times when smoke impacts are likely to be minimal. Also, sugar cane can be harvested green, which removes the associated smoke impact. Industries can use pollution control devices to remove pollutants by absorbing, filtering, diluting or dispersing them. Government licensing and regulation are effective ways to minimise emissions from industry. These are some of the most common devices used to control industrial pollution. 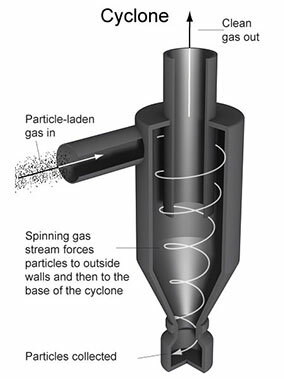 A cyclone works on the principle of creating a high-speed spiral airflow to remove particles. This spiral motion applies a centrifugal force on the particles. The inertia of the particles forces them to the outside walls of the cyclone, where they fall to the bottom and are collected. The speed of the airflow and the width of the cyclone influence particle removal—the smaller the diameter the more efficient the particle removal. The conical section at the base of the cyclone gradually decreases the diameter of the spinning gas stream, resulting in better removal of smaller particles. However, in practice, reducing the diameter increases the pressure drop across the cyclone. Combining several units together as a ‘multicyclone’ can prevent this. 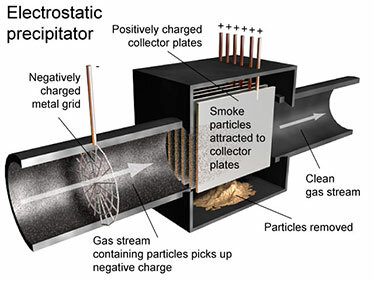 The electrostatic precipitator works by removing particles and smoke from a gas stream using an electrostatic charge. Dust particles travel past wires that have a high direct current (DC) voltage applied, which ionises the surrounding gas. This corona discharge causes the particles to pick up a small electrostatic charge. An oppositely-charged plate attracts the particles, neutralises and retains them. A regular tapping (rapping) of the plates then physically removes the collected particles. Introducing a water spray can reduce the electrical resistance of the dust particles, allowing them to accept the charge more easily. Electrostatic precipitators are an efficient way of removing particles and do not cause a significant pressure drop across the unit. 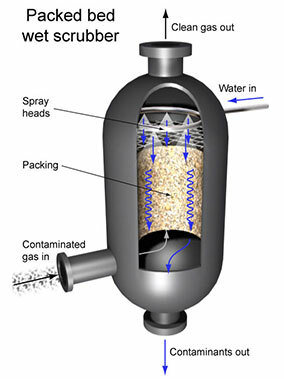 Bag filters use fabric bags to remove particles from dust-laden gas. They can achieve high efficiencies for fine particles because of the build-up of particles on either the inside or outside surface of the bag depending on the design. As dust builds up, the pressure across the bag increases, so the filters need regular cleaning. Usually bag filters work in tandem—one filter is working while the other filter is being cleaned. Mechanical shaking, using a reverse airflow or a pulse of compressed air are used to dislodge the dust from the fabric surface, which then falls by gravity into a collection system. A packed bed wet scrubber removes gaseous and particle contaminants from a gas stream. It works by bringing the gas stream into contact with a scrubbing liquid (usually water). The scrubbing liquid absorbs the gaseous pollutants, and the spray droplets physically capture the particles. The packed bed of non-reactive material gives a greater gas-to-liquid contact which improves the removal of particle pollutants. Although the packed bed wet scrubber can remove gaseous and particle pollutants, the particular design makes it more efficient at one or the other. Using certain scrubbing liquids can increase gaseous pollutant removal, e.g. using an alkaline liquid to remove acidic pollutants. Trapping and treating droplets of the scrubbing liquid can allow it to be recycled.